Busting Myths About Artificial Grass / Synthetic Turf!!! - Lawn Kings Inc.
Busting Myths About Artificial Grass / Synthetic Turf!!! Home/blog/Busting Myths About Artificial Grass / Synthetic Turf!!! Artificial Turf / Synthetic Turf: Myth Busting! Over the years we’ve run into several, persistent and we think incorrect ideas about artificial turf that we (and we want to be kind here,) think are simply misconceptions. In this post we’ll refer to these misconceptions as “myths”. These myths range from artificial grass being; too expensive, having unsafe materials, to synthetic grass not draining well, not good for pets, and several others. It seems that when homeowners and commercial buyers hear about all the benefits synthetic grass offers, some people think artificial grass is too good to be true. They assume that installation must be incredibly involved or perhaps the artificial turf itself must be difficult to maintain, other myths prevent consideration as well. These misconceptions or myths can lead people to consider artificial grass unfavorably and sometimes immediately dismiss synthetic grass / artificial turf for consideration. We think this is a huge mistake, synthetic grass / artificial turf can save up to 55 gallons per square foot of water per year over a conventional sod. 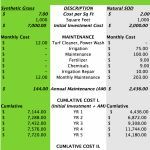 Synthetic grass saves money and your time! (please see our blog on Synthetic Grass vs. Natural Sod). Below are common myths about synthetic grass / artificial turf we’ve run into that we’ll debunk. 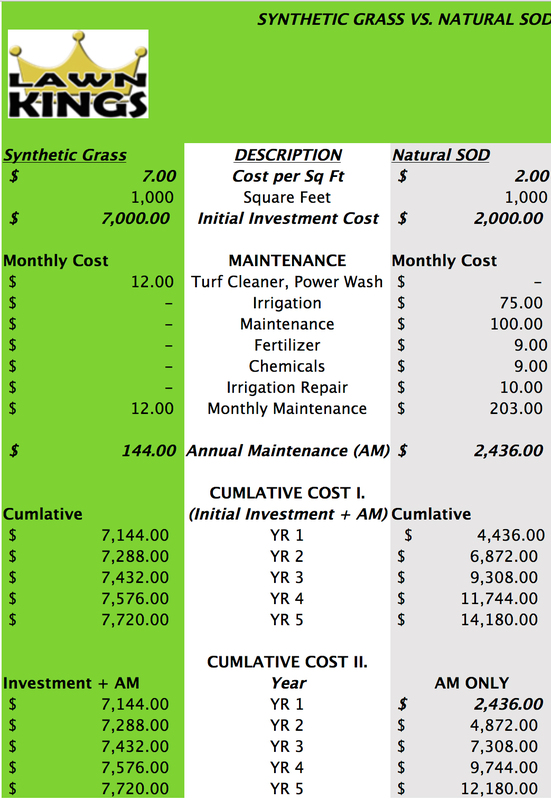 Simply put, synthetic grass / artificial turf is a cost-saving investment. Artificial grass can last for two decades, savings in landscaping and water use could eventually be in the tens of thousands. Consider too that a good-looking home with synthetic grass increases the value of your property. Like a kitchen remodel or a new roof, artificial grass adds equity to your home. We understand the basis of this myth because to be blunt – at one time it was true. Nowadays (haven’t ever used that word before) high quality synthetic grass is gorgeous! Without going into it too much technically, quality synthetic grass has; two color tones, along with one or two-color thatching sometimes (which simulates dead grass), blade shapes which can be C, W, S, shapes – this is when looking from the end view of the individual blade. These blade shapes deflect the sun’s rays, so it doesn’t appear shiny along with a texture or burnishing of the blades (also called yarn). If you haven’t seen modern turf, when you do this myth will be busted for sure. Not true, but pretty darn close. Those people new to synthetic grass think there must be a lot involved with maintenance and upkeep. They have the idea that “it can’t be that simple!” yet is, compared to sod, artificial grass doesn’t need to be regularly watered, it also doesn’t get weeds or die from extreme temperatures and pet use. Even so, the artificial grass owner can’t just leave it alone for years and hope that it will stay in good shape. Some maintenance is required and its measured in minutes per year instead of hours per week. Monthly rinsing and brushing sometimes might be required along with an annual deep cleaning. Pet owners may decide to do a little more but again this is minimal. Call us for details about maintenance! When raised this is something we take seriously because we want you to have zero problems with drainage. First let us mention that the infill on top of the turf is essentially sand and rain will pass through it easily. The turf itself is very permeable. Most artificial grass backing is perforated with holes that measure approximately ½ centimeter in diameter and can drain at a rate of more than 30 inches per hour per square yard. This is typically better than a natural lawn. Keep in mind that underneath the turf there is up to three inches of ¾” material – or class II road base. So, water passes through the infill, the turf, the base material, and then on to the substrate. There are several things we evaluate prior to installation such as the height of the ground drains, slope of installation area, drain pipe location etc. Synthetic grass / artificial turf typically drains better than sod however this is a matter we take seriously to ensure there are no issues after the installation. Our synthetic grass / artificial turf is fully tested. Unlike natural sod, which is often sprayed with pesticides to prevent weed growth, artificial grass is designed to be safe for all humans and animals. The Lawn Kings brand of synthetic grass utilizes polypropylene in the manufacture of the turf fibers. This is the same material used to manufacture; disposable eating utensils, baby bottles, and Rubbermaid® products, for example. So, the synthetic grass product is very safe for interaction with families and pets. In addition, Lawn Kings sends out all products to be full tested for lead content in addition to a battery of other tests. In short, we offer a safe, fully tested, clean product. Other quality turf suppliers do the same, so don’t be shy about asking for documentation, from us and our friendly competitors. Actually, it is very common to request such documentation from the HOA Boards that consider and purchase our synthetic grass, as well of course to the homeowners who live in HOA’s. We have full documentation packages available for all our products.